Tell me off the top of your head. Good evening, this is Yumitomato. I know that many members of FESS have a wide knowledge, therefore, I guess you would know the geometrical object. 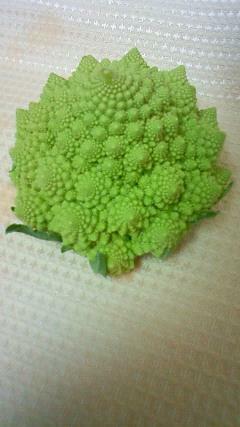 It is Romanesuco, an Italian origin vegetable. Ｙou can make salad with it or also fry it with olive-oil. You may enjoy the texture like a cauliflower. To be honest, it has not come from Italy, but it has been grown and sent by my mother living in Chiba prefecture. She is na?ve about the prices of uncommon products, so then, she priced it for only \100 to sell it at a local street vender, you might see it being sold for over \300 at an international supermarket though. Unfortunately, I have not yet seen it at any supermarkets around Shimofusa-nakayama. If you will meet it which is sold for under \200 around you, please tell me.